burger king | Keep It Up, David! I Spent Four Days Driving. Here’s All The Ways I Stayed Healthy On My Road Trip. 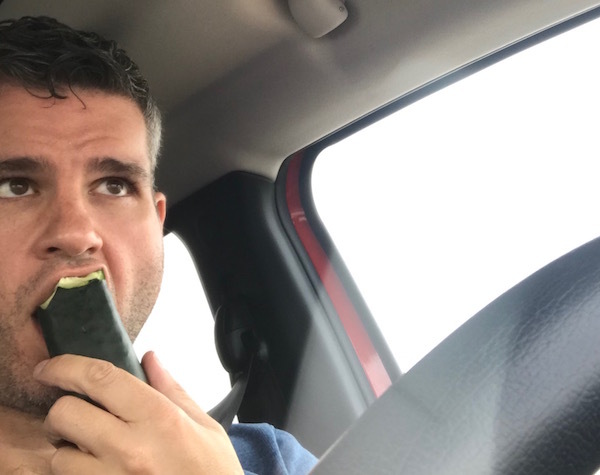 Yes, it’s a cucumber, and yes, I’m eating it whole, like an apple. Gotta eat smart while on the road! My second flat tire in two weeks. Both of them passenger’s side rear tire. Yep – that means the brand new tire I bought two weeks ago is now flat. Whoop-de-do! Maybe today is the day I should start buying lottery tickets! I’m now an pro at putting on my spare (which I chronicled in my blog a few weeks ago here), but I took pictures once again, with the thought that maybe if I keep documenting my car troubles then they’ll go away. We’ll see if that happens – it’s just a thought. I’m not saying every thought of mine is a good one. Oh, and did I mention that the parking lot I pulled into belonged to a Burger King? So my annoyance levels were sky-high – firstly, that I basically blew $100 on a tire for two weeks of use, and secondly, that I had to change a tire within smelling range of hash browns and croissanwiches, which I love, but haven’t eaten since 2009. I was also within earshot of the people placing their orders in the drive-thru. Apparently, Burger King now has a Breakfast Ciabatta Club Sandwich. I have no idea what that is, but after hearing two consecutive people order them, I really really wanted one. My tire-changing time this go-around was cut in half – from 45 minutes last time, to about 23 minutes this time, and, after I was finished, the Burger King 25 feet away provided me someplace to wash my hands and pee and wash my hands again, so maybe it wasn’t all bad to have pulled in there. I found a tire store in Glendale (not too far away from where I was stranded, in Highland Park) on my Blackberry and headed there, and got a new tire for $85 bucks – less than the $100 I spent last time. When I got home, I grabbed my mail out of my mailbox, and got the credit card bill that includes the tire charge from 2 weeks ago. Sigh. In the plus column, the park workout was fantastic, the little funk I was in yesterday seemed to be gone, and later today I plan to get a little more cardio in, by heading to the gym and conquering my StairMaster goal of climbing 73 floors without stopping. As always, I will keep you posted.